Talk with your loved ones ahead of time. This can be a difficult thing to do especially with parents that are guarded about their finances or very private lives. However, it is vital to have a talk with them prior to illness or mental decline. Take the approach with your loved one that you want to ensure that their wishes are known to the whole family and therefore will be upheld. If you meet resistance with this approach, then you may consider getting the assistance of a trusted friend of your loved one or clergy person. Plan both legally and financially. Consult an Eldercare Attorney to help your loved one to execute a Will, Durable Power of Attorney, Health Care Surrogate, and/or Living Will. In addition, discuss future needs such as Medicaid planning and other financial and care issues. Become educated. Learn about the available resources in the community to help your loved one meet his or her needs. Find information from your doctor or on the internet about your loved one’s disease process in order to learn what to expect over time. Also, enroll in caregiver educational programs, support groups and seminars. Take care of yourself. Watch your diet, exercise and get plenty of rest. Make time for shopping, lunch with friends or even getting a hair cut and/or manicure. Again having knowledge of the community services such as companion or adult day care services can allow you to have a break to do things for yourself. Ask for help. It is not failure as a caregiver to ask for help. 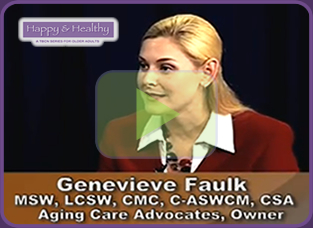 Support can come from family, friends, Geriatric Care Managers, and community resources. Geriatric Care Managers can provide advocacy to loved ones and help caregivers navigate through the complexities of the health care system. Also, caregiver support groups can be a great source of comfort and reassurance by others in similar situations. Manage your stress level. Stress can cause both physical and mental problems. If you experience symptoms of caregiver stress, use relaxation techniques that work for you, seek professional mental help, and consult your doctor. Accept changes as they occur. As your family member ages so do their needs. At some point in time they may require care beyond what you can provide on your own. When that time comes if you have gained knowledge of local resources, you will already be aware of the community services such as in-home caregiver services, adult day care, senior community care, etc. Be realistic. Grieve your losses related to yourself & family member, but also focus on the positive moments. Think of good times with your loved one and/or create new ones. Give yourself credit, not guilt. Feel good about yourself! Do not feel guilty because you feel you can do more. You are doing the best you can and you are only human. You cannot possibly devote every minute of every day to your loved one as you too have a life of your own that you must tend to. *Most Important Tip. Taking care of you is one of the most important ways to be a healthy caregiver now and in the future. Keep in mind the example of airlines requesting that parents put on their oxygen masks first in the event of an emergency before putting the masks on their children. Take care of yourself first so you can best take care of your loved one.